Davies was born in Sedgefield, County Durham (1949) and studied at Trent Polytechnic, Nottingham. His early works focused on the rural landscape, but he later turned his attention to the Northern industrial cities. This series of works, was started in the 1980s, takes its title A Green and Pleasant Land from a line in William Blake’s poem Jerusalem. 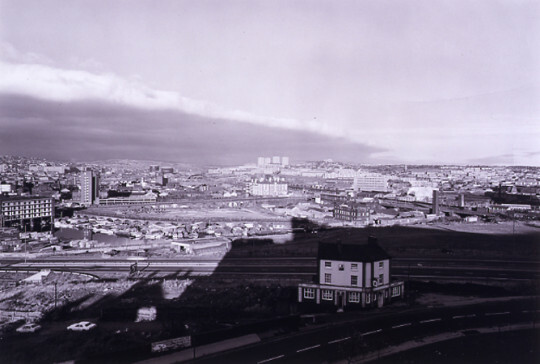 Durham Ox presents a panorama of Sheffield being regenerated; the last monument to a lost community is the local pub. Stockport Viaductshows the reflective waters of the River Mersey flanked by warehouses; the civic architecture of the future is seen through the soaring arches of the Victorian viaduct. As Davies said, ‘I’ve always thought it important to make beautiful pictures that draw people in, so I decided to use a romantic style – or, rather, to take romantic pictures in unromantic places’.